Most of your applications need not run in cloud today. But, you might find yourself moving to cloud very soon. So how do you prepare for this scenario? It is not very difficult to accomplish this. Best thing you can do is to keep track of all the features available in cloud (ex: file system etc.). While designing your application avoid using those features which are not available in cloud. I will give a practical example that happened in recent past. I was designing the system to store all the patient documents and images. Did lot of reading (BTW: We use SQL Server 2008) and almost decided to go with FILESTREAM (for obvious benefits). Then I bounced this off to one of our Sr. Engineers, his first question was what happens when we move our solution to cloud (such as azure)? His question had clear answer in it!!! So, even though storing images in the database was not an optimal design choice, we had to compromise and take that path. My friend sent me this link. It is an interesting way of looking at healthcare. “Most under utilized resource in the healthcare ecosystem is patient”. Well before I saw this video, we thought about incorporating so many features in our software which will enable patient and their family members to participate in the treatment (even better prevention). I have blogged about it in one of my previous blogs. Future software solutions used in cancer treatment are going to look lot different. They have to support the new model of care. One new model that is emerging in the oncology space is ‘Medical Home’ concept. Achievement of level III (highest level) NCQA recognition required that following nine criteria be met. 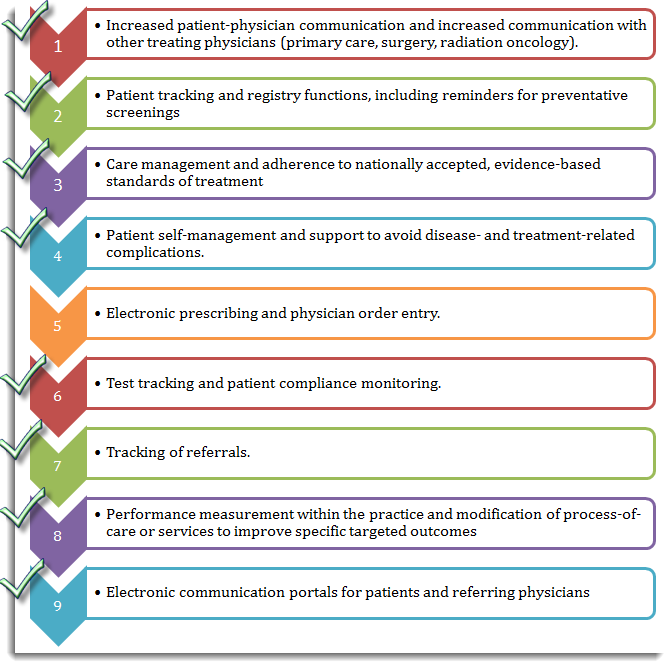 Our oncology software has incorporated 8 out the 9 criteria. We have built a new platform. It is easy to provide value-oriented, outcome-based cancer care delivery system using this platform. Before we started developing our product we thought we had a great vision (we still do!). It is very hard to convince people without some tangible stuff. We decided to build something tangible before we go and talk to anybody. We had to put all the pieces together. This includes assembling a good team, architecting and designing, buying required software/hardware and hosting infrastructure. Also you have to raise money to execute,test and deploy. Fast forwarding to the beginning of 2012, the whole team at Palisha is very proud of what has been accomplished (yet knows that, it is still a long journey ahead of us). Version 1.0 of our software is ready. There are some 25,000 patients in our test system. We have hosted our solution in internet. Tested the performance of our web and mobile applications. Now that we have a tangible thing which people can touch and feel, our goal is to convince right players in the industry. One thing we control in our life is ‘how much effort you are willing to put’. We are doing our part. Lot of effort has been put into producing V1.0 and we continue to execute at the same pace.